Following up on the “Amazon Tax” news from earlier this month (which still hasn’t been signed or vetoed by Gov. Quinn), I figured a write-up was in order explaining a new addition to your 2010 IL-1040 Tax form. After reading and listening to biased lobbyist groups pushing for the “Web Business Bill” to be signed, I figured I needed to back up my argument with more details on how to self-report the sales tax owed to the state for the Illinois Use Tax. Illinois Use Tax is a sales tax that you, as the purchaser, owe on items that you buy for use in Illinois. If the seller does not collect this tax, you must pay the tax to the Illinois Department of Revenue (IDOR). The most common purchases on which the seller does not collect Illinois Use Tax are those made via the internet, from a mail order catalog, or made when traveling outside Illinois. If you’ve spent over $9600 or owe more than $600 in tax where a sales tax wasn’t collected, you’ll have to file Form ST-44. Just a few of the vendors you might have to consider your purchases from include Amazon, eBay, Steam, iTunes, or NewEgg. Here’s what you’ll see on Line 22 of the 2010 IL-1040 Form, particularly the ‘Do not leave blank’ part. Your total Use Tax, which I’ll show how to fill it in next, will either reduce your refund or increase the amount you have to pay into the state. You’ll find the details on line 22 on page 8-9 in the IL-1040 Instructions booklet. There are two ways to calculate your Use Tax. If you had no major purchases and don’t have your receipts, you can find your use tax based on your Adjusted Gross Income. If you do have your receipts or had major purchases where Sales Tax wasn’t collected, you are rewarded with some homework to do with the Use Tax Worksheet. Essentially, you total your general merchandise purchases and multiply by 6.25% and total food, non-prescription drugs, and medical appliance purchases and multiply by 1%. Total those two products and you have your total Use Tax to put on Line 22. 2. IL-PIN – Illinois Personal Identification Number. 3. Date of your last purchase of general merchandise. 4. Total cost of general merchandise you purchased outside Illinois to use in Illinois. 5. Total cost of qualifying food, drugs, medical appliances, and diabetic supplies, such as insulin and syringes, you purchased outside Illinois for use in Illinois. 6. Amount of sales tax you paid to another state (not to another country). For me, that comes out to $128 I owe the state in Use Tax for 2010. With the amnesty program, this can add up to a significant amount when you add up the Use Tax owed between July 1st, 2004 to December 31st, 2010. 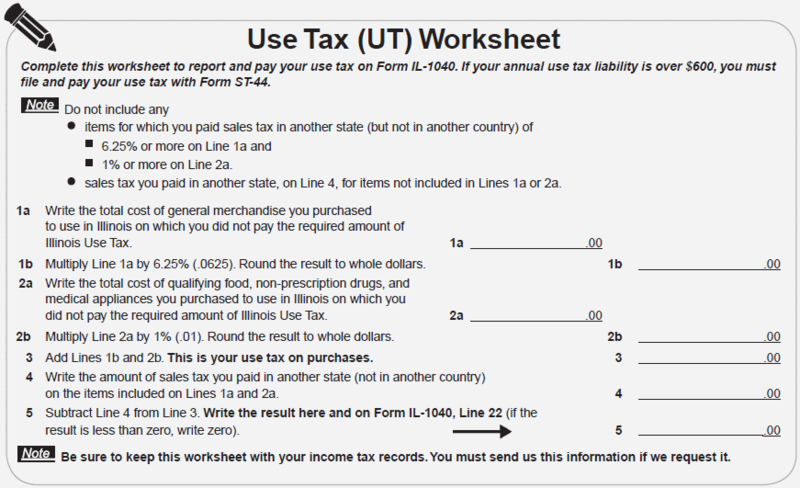 Update: The Use Tax is now Line 23 on the 2012 IL-1040 tax form. I am not an accountant or a tax preparation agent and this coverage is provided for information purposes only. It is your responsibility to meet the legal requirements of your state. Ask 404TS: What router should I get to improve wireless coverage?